This Roasted Olives Recipe features a variety of olives, caperberries, garlic, herbs, and soft and mellow feta cheese to finish it off. It is a quick, easy and elegant olives appetizer that will surely impress! I keep the ingredients on hand and can easily whip out this attractive and delicious appetizer in less than a half-hour. In fact, I have even frozen the feta and it defrosts just fine. Truthfully, the most time-consuming part of this Roasted Olives Recipe is peeling the garlic, but if you have a silicone garlic peeler, then even that process is quick. While the buttery Castelvetrano olives will always be my favorite, feel free to use any combination of olives that you prefer. I opt for pitted olives and the addition of caperberries, but this recipe is endlessly flexible. Of course, this assumes you like olives. A friend of mine just recently told me she didn't like olives! I mean, is that a thing? I didn't even know people like that existed! You can serve this delicious olive appetizer warm, right from the oven or at room temperature, just put out some little plates and toothpicks and let your guests enjoy. A quick, easy and elegant appetizer that will surely impress! This Roasted Olives Recipe features a variety of olives, caperberries, garlic, herbs, and soft and mellow feta cheese to finish it off. Sprinkle herbs and olive oil over olives and stir/shake to mix. Remove olives from oven and spoon over feta cheese. 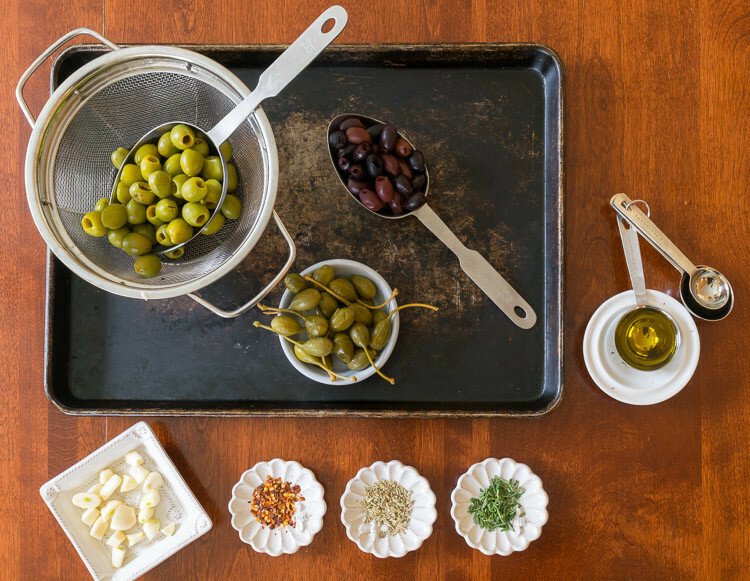 If you like olives as much as we do, make sure to check out my Marinated Castelvetrano Olives recipe…a family favorite. 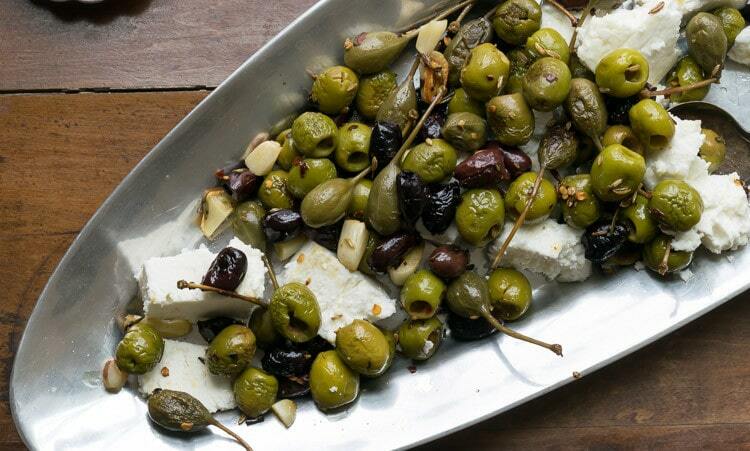 And bookmark this page or pin the following image to refer back to this Feta and Roasted Olives Recipe for your future reference. You can access many of the products I refer to in making this Roasted Olive Appetizer and all of my posts on my Nourish and Nestle Amazon Page. You can access it here. I never would have thought to roast olives! I will definitely be trying this recipe! Oh Maureen…it is SOOOOO good…and so easy! Enjoy my friend. Oh wow! I am a big fan of olives, this needs to happen in my house very soon. Thanks for the recipe! Oh, you will LOVE it!!! And I knew I liked you….fellow olive fans! I do hope you make and enjoy this dish! I TOO am one of those people and YES I exist. Oh no! Your numbers are growing! 🤣 That’s OK…more for me! Have a happy, olive-free, weekend my friend.